I am the proud owner of Ellie, a 14-week-old golden mix rescue dog. She has a floppy ear (hence the name Ellie, like an elephant), big paws, and a super playful demeanor. As a marathoner, I’ve been asked the same question more than once: “Will you take her running with you?” Once she’s older – if she’s into it – absolutely. But there’s more to running with a dog than fastening a leash and heading to Central Park for a jog. Here are nine tips to review before you take your dog on a run. In most cases it’s best to wait until your dog is one to two years old – depending on the breed – before running together.1 Dogs’ muscles and bones need to be fully developed to avoid putting stress on them while they’re still growing. Check with your vet, though: Smaller dogs are often physically ready to start running before larger dogs. Beyond the dog’s physical abilities, keep his or her maturity and training levels in mind. 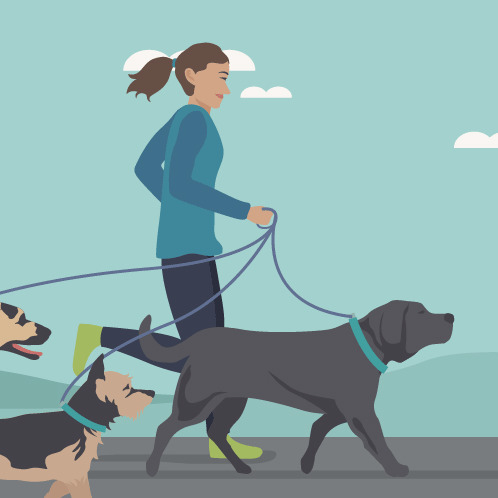 Before you run together, your dog should be comfortable on a leash, not skittish around other people or dogs, and trained to respond to his or her name when called. Your dog should also be at the point that he or she respects you as the dominant leader in the relationship. Even though it may seem like the pup sometimes makes the rules, you are in charge. Not all dogs are interested in running. Retrievers, shepherds, terriers, vizslas, and Labradors can be great running buddies. But really big breeds (such as mastiffs and Great Danes) or really small breeds (such as Chihuahuas, pugs, and French bulldogs) may not be up for it or built for it. Your dog’s everyday collar and leash probably won’t be secure enough when you’re running together. It’s best to invest in something sturdier. The leash should extend around two to three feet from you to keep a safe distance.2 A leash that’s too short won’t allow you or your dog any freedom. 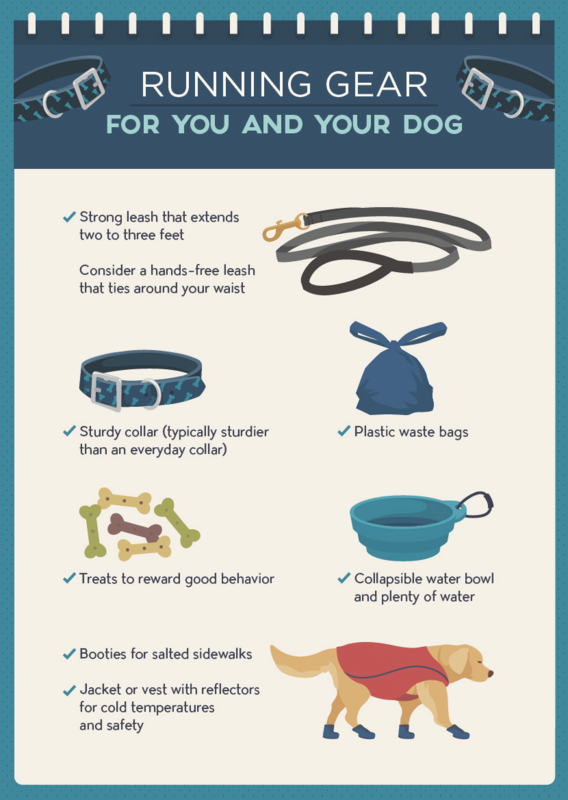 And a leash that’s too long can be hazardous for you, your dog, and the people around you. (Too much slack can get in the way of other people or objects.) Check out Cardio Canine or The Buddy System for great hands-free leash options that tie around your waist. Always bring plastic waste bags along for a run so you can clean up after your dog, and throw a few treats in your pocket to reward good behavior. If you don’t plan to carry water with you (in a handheld water bottle, for example), pick a route with water fountains, and try to stick to shaded areas as much as possible to avoid overheating. The bigger the dog, the more water it requires. A general rule of thumb: your dog should drink roughly 0.5 to 1 ounce of water per pound per day.8 (So a 65-pound dog, for example, needs 33 to 65 ounces of water per day.) Runs are in addition to your dog’s daily hydration schedule, so stop for short water breaks on the run if you’re out for more than 30 minutes. You may want to carry a collapsible water bowl too. Keep the weather in mind: hot days call for additional hydration. Your dog’s hydration needs aren’t all that different from yours. Try to prevent your dog from drinking too much within the hour before you go running; like with humans, it can lead to an upset, sloshy stomach while your dog is running. Tempo runs, interval workouts, or any type of run that’s an essential part of your training plan should be done solo or with a human companion. Running with your dog is a time to bond and enjoy each other’s company – not to hit race pace. Enjoy the quality time away from real-world distractions and really tune in to one another. Before you know it, your best friend may be the best running buddy you’ve ever had! Pay extra attention to your dog’s behavior after your run. Always include a five- to ten-minute cool-down walk at the end of your run to get both your heart rates back to normal. Watch for signs of soreness or limping in the days that follow your run. If it’s hot out, help your dog cool down with a damp towel. Running with your dog should be fun for you and your dog. Teaming up and running with your beloved pooch shouldn’t add stress to either of your lives. It’s a time to bond, get some exercise, and enjoy the outdoors together. So lace up, leash up, and enjoy!